The series consists of twenty, four-page typed news bulletins. The Catholic Youth Organization (C.Y.O.) 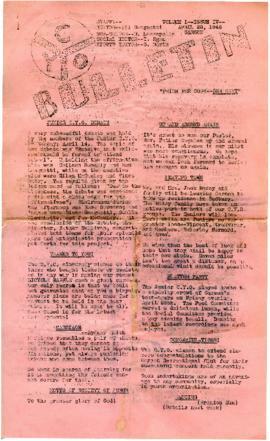 Bulletin was used to promote events being held by the C.Y.O., such as upcoming dances, parties, debates, outings and concerts. The sports section was usually the largest in the bulletin, advertising hikes, bike-hikes, baseball and hockey games, bowling tournaments, dart tournaments and skiing trips. Church events and special services, as well as births, marriages and deaths, were also reported. The bulletin featured regular articles, like 'It is Rumoured' and 'We Wonder...,' which both published blind gossip concerning members of the C.Y.O. ; 'Howlers,' which included three or four jokes per week, and 'Do You Know?,' which provided random pieces of trivia. 'Over the Miles' was another featured article which reported on visitors in Garson and Falconbridge, as well as those members of the parish who were leaving town and whether their trips would be of long or short duration. The majority of the bulletins also had a 'Special Interviews' section, which posed six set questions to selected members of the C.Y.O., asking them their nickname, their ambition, their favourite saying and favourite song and their dislikes. Four or five interviews were published in each issue, giving a personal glimpse of the members of the C.Y.O. at the time. Another regular article was titled 'Helpful Heddie,' in which "Heddie" offered advice on a range of problems, such as how to make cinnamon toast to serve with hot cocoa, how to overcome shyness and Christmas decorating ideas. Each week an editorial was written by one of the members of the C.Y.O. and touched upon a popular issue, such as juvenile crime or modernization, or an event in the church, such as Lent or Christmas, and provided the writers opinions and ideas about the subject. An issue could be purchased for $0.01, or a yearly subscription could be bought for $0.50 for local subscribers and $1.00 if the bulletin was to be mailed.